When the homeless begin sleeping on the bare concrete again rather than over subway grates and such, you know spring has finally arrived here in Toronto. This photo was taken outside of Allan Gardens Botanical Greenhouse downtown a while back. This entry was posted in Canon EOS T2i / 550D, Downtown Toronto and tagged Art, Digital Photographs, Digital Photography, Downtown Toronto, People, Photo Art, Photographs, Photography, Photos, Street Photos, Toronto, Urban. Bookmark the permalink. Thanks Teo. Yeah, I wanted a title that contrasted the photo. 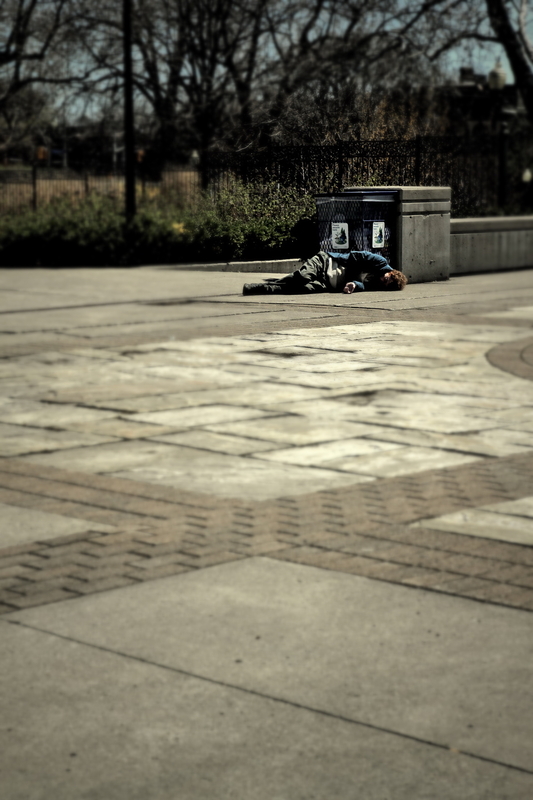 The blur I added in post processing to accentuate the homeless guy. ‘You think the only people who are people, are the people who look and think like you. But, if you walk the footsteps of a stranger, you’d learn things you never knew you never knew’. How many of us are a footstep away from this situation? And very powerful quote. Yes, you are right. How our social safetynet here in Toronto works is if you have anything at all you don’t qualify for help. Once you’ve lost your car, your house, your belongings, your family, feel free to give us a ring and we’ll see about getting you a cheque for assistance. If the cardboard box you’re living in under a bridge is too large, you don’t qualify for assistance. Funny, but sad. I guess you guys south of the border have even bigger troubles in that if someone gets seriously sick they can lose everything trying to pay for their recovery. I remember a U.S. inspector on a home inspectors forum mentioning he’d be diagnosed with cancer or something and all the other inspectors were chiming in about which hospital and treatment costs less and such. For me the conversation was simply surreal. I just couldn’t get my head around the idea of paying for healthcare out of pocket. I know this is a huge debate in the States and I don’t want to step on anyone’s toes but it does sound pretty scary. And no doubt your insurance companies are no better than ours. We don’t need insurance for healthcare but we do for home and auto, and the insurance companies only want people who have perfect driving records with no claims, tickets or accidents, and houses that are in perfect condition even if they are 50 years old. Any blip in your record and you’re lucky to find an insurer and if you do you pay a fortune. This will make you laugh…the ‘quote’ is actually lyrics from a DISNEY song!! One of my favorites since the words are so very powerful and talk about respecting nature’s creatures and taking the time to really see the beauty all around you. I use it often as background music for slideshows of my images as it so eloquently illustrates my passion for photographing nature. Yeah, healthcare is pretty messed up here in the states. You basically spend your life hoping you NEVER have to use your health insurance! A Disney tune; why doesn’t that surprise me from you. 🙂 It really is a great quote, though. We have our own issues around Healthcare, but just not when it comes to costs. If you happen to see any of Michael Moore’s Crapumentaries, let me assure you things in Canada are not nearly as rosy as he makes them out to be.